Proper compressed air supply to the IS Machine, in glass container manufacturing, is critical. Each process requires carefully controlled pressure, air quality (dryers), and flow as necessary for optimum production with minimum scrap. Most IS machine operations, which Air Power has reviewed over the years, offer significant energy savings opportunities with low capital costs. The final results also enhance quality and productivity. What is an IS Machine? The heart of any glass container manufacturing process is the IS machine; often termed the “press and blow process”. Figure 1 is a generic representation of this basic process. The initials “IS” stand for Individual Sections. Each section produces a container independently. Most IS machine are described by the number of sections, i.e. 10-section unit has 10 molds. There are also tandem units, i.e. a 10-section tandem unit will have 20 molds. Another description is how many is a gob? A gob unit fills one section at a time. A three gob unit fills three at a time. The gob being delivered to the mold comes from the furnace through the forehearth where it conditions and usually gets to the mold entry at about 1800 to 2000°F. The type and size of the appropriate IS unit is dictated by the type of glass product material, size, and production levels. Regardless of the type of glass container, it is always critical to control the pressure and temperature throughout the process. The compressed air supply has a huge impact on this. In addition to the obvious final blow air (which is usually low pressure at or less than 55 psig) compressed air is used to drive the plunger up and its cooling for various operations in the machine such as mold closing, inverter, pilot air, push out air, blank close, and baffle air. Many times there are often cases of cooling air such as spout ring gear and motor cooling. 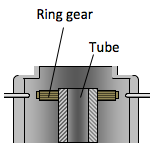 Spout ring gear cooling on an IS machine is handled by blowing compressed air through ring feed tubes blowing on the ring gear. The main feed line is often from the high pressure system which has a high entry pressure and later regulated to the lower pressure. Sometimes the line size before the regulator must be increased to create an adequate air supply when switching to low pressure air. Feeds to the regulator should be as short as possible and as large as possible. Typically press and blow glass container manufacturers use two separate air systems- a low-pressure (50-70 psig) and a high-pressure (90-100 psig) system. These systems are usually set up with two separate compressed air supplies and two separate piping distributions. The low-pressure air generally goes to the ”hot end” of the plant to the furnace forehearth and IS units. The high-pressure air also goes to the “hot end” for selected uses and to the “cold end” of the plant for packaging, palletizing, shipping – applications which are almost 100% high-pressure air use. Most plants have some type of controlled (hopefully) crossover valve to allow occasional high pressure air to help the low-pressure air supply. Until the last decade, most glass container plants had dry high-pressure air but wet low-pressure air. Because of this, many plants are researching and some are implementing the benefits of drying the low-pressure air. The IS machine mold receives a typical 2000°F gob of glass. Once the air (even saturated) enters the IS unit, there will be no further cooling and therefore no condensate generated. Correct piping with appropriate storage tanks, drain legs, and automatic condensate drains will keep the liquid out of the molds and therefore not affect production. Plants used water-cooled aftercoolers without further drying. In an effort to keep the remaining water vapor in vapor form, some plants employed a “reheater” (Figure 3). This used a second exchanger after the water-cooled aftercooler which used the incoming hot wet air to reheat the outgoing aftercooled air. The results of this action were mixed. The same amount of water vapor was still in the low-pressure compressed air. Where it fell out as liquid condensate totally depended on operating conditions. These reheater units were and are available as a commercial product from several heat exchanger manufacturers. Most control valves, solenoids, and auto drains have their life significantly reduced with liquid condensate present. The use of oil-free centrifugal compressors for the larger high and low-pressure air supplies eliminated oil carryover into the system, but left it with a relatively aggressive acidic condensate which exacerbated the issue. Drain holes drilled in air lines to stop the condensate from entering the area. Drain holes drilled in control valves and solenoids to keep the condensate from going downstream. Drain valves open in receiver filters and risers because the automatic condensate drains are ineffective. Is Your IS Machine Using High-Pressure Instead of Low-Pressure Air? Many IS machine operations, that could be run on low-pressure air, are put on high-pressure air and regulated down to the needed lower pressure because the high-pressure has had the moisture removed by compressed air dryers. Table 1 below reflects the current operating data of two centrifugal based compressed air supplies – one low-pressure (50 to 51 psig), and one high-pressure (88 to 89 psig). The dollar per scfm per year cost is the actual operating cost based on the plants’ measured data. It only reflects actual electric operating cost to produce the air – no maintenance, water, drying costs, etc. As shown in Table 1, the average annual electric energy cost to produce the high-pressure air is $196.66 scfm/yr and the cost to produce the low-pressure is $123.60 scfm/yr. When high-pressure air is used, instead of low pressure air, the extra cost to this operation is $73.06 scfm/yr. This is $73,060 per 1000 scfm demand if it is misapplied high pressure air. In Figure 4 note the numbers below 55 psig - all of these IS machine pressure settings are on high-pressure air and regulated down. The main feed line from the high-pressure system has a high entry pressure which is later regulated down to the lower pressure. Figure 4. 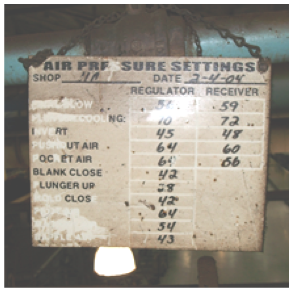 Recommended pressure settings in a press and blow glass container plant on an IS Machine. When using lower pressure air, increase the line size before the regulator to create an adequate air supply. Again, feeds to the regulator should be as short as possible and as large as possible. Table 2 shows a partial listing of common applications in the press and blow mold IS units where high pressure may be able to be replaced with low-pressure air. This can be an effective investigation target list for personnel use. It is important to point out that this variance is very site specific. It depends not only on the specific power of the base compressors, but also the effectiveness of the controls, maintenance, piping, etc. Too often, when a press and blow glass container plant is reviewed for compressed air savings and productivity improvements, the “hot end” is ignored because of perceptions that any changes are improbable if not impossible. Over the years, Air Power has found that great steps can be taken by identifying and reviewing the actual cost per scfm/yr of using high-pressure air, instead of low pressure air, with operating personnel. In order to do this, significant knowledge of what is going on in an IS machine is required in order to find intelligent ways to increase the productivity of this critical production process. For more information contact Hank van Ormer, Air Power USA, tel: 740-862-4112, www.airpowerusainc.com. To read more System Assessment articles, visit www.airbestpractices.com/system-assessments/end-uses.